1 oz Gold Bars. Queen’s Beast Series. 1 oz Silver Bars. 5 oz Silver Bars. 10 oz Silver Bars. Kilo oz Silver Bars. 100 oz Silver Bars. Proof & Mint Sets. In order to provide our customers with the best quality certified coins, PCE, Inc. Only deals in NGC and PCGS certified coins. NGC and PCGS are the most highly respected third party grading services in the coin industry today. Customer service is our number one goal. The coin pictured is only a representation of the coin you will receive, not the exact coin (serial numbers will vary). All of our packages are fully insured. Other methods may be used depending on circumstance. This time frame is only an estimate, not a guarantee. Once an order is placed it can only be canceled not adjusted. We always do our best to provide our customers with speedy service; however some things are out of our control. There is always the possibility for a delay due to these third party services or the possibility of a product becoming damaged or lost in transit. The simple fact is, all of the above-described scenarios are unacceptable to us and we will never put this burden on our customers. If anything happens to a product in transit, we will always be willing to replace the product. For large orders with customers that we do not have a previously established business relationship, a wire may be necessary. This will be determined at the discretion of Pinehurst Coins. We do not offer discounts unless it is otherwise posted on our listing. Please see individual listings for details. Placing an order locks in your price. We do not offer price adjustments on our items. Both the precious metals and numismatic markets can be volatile and change on a regular basis. Placing your order locks in your price and this price cannot be adjusted. We always do our best to satisfy our customers. ALL BULLION ITEMS ARE FINAL SALE. Due to the volatile nature of the bullion market all gold, silver, platinum and palladium bullion sales are final. You may cancel your order, however all cancellations will be subject to any market loss as described in our Market Loss Policy. Founded in 2004 by current President and CEO Vincent Wade, Pinehurst Coins is a family owned and operated business. Since the companies inception, the goal has been simple; create a business model in which the client always receives excellent customer service and a quality product at the best possible price. We have stuck to this model and never looked back. At Pinehurst Coins we are very much aware that coin collectors are immensely pragmatic and detail oriented. We know what our clients want and what they expect. This is precisely why we always go the extra mile to ensure every coin we sell has been thoroughly inspected by one of our full time numismatists before it ever makes it into our client’s hand. For those of you who are existing customers and are taking the time to read this; we thank you. As for the first time customers, we appreciate you giving us a chance to meet your numismatic needs and we promise that you will not be disappointed. 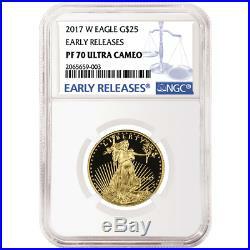 The item “2017-W Proof $25 American Gold Eagle 1/2 oz NGC PF70UC Blue ER Label” is in sale since Friday, February 24, 2017. This item is in the category “Coins & Paper Money\Bullion\Gold\Coins”. The seller is “pinehurstcoins” and is located in Pinehurst, North Carolina. This item can be shipped to United States, Canada, United Kingdom, Denmark, Romania, Slovakia, Bulgaria, Czech republic, Finland, Hungary, Latvia, Lithuania, Malta, Estonia, Australia, Greece, Portugal, Cyprus, Slovenia, Japan, China, Sweden, South Korea, Indonesia, Taiwan, South africa, Thailand, Belgium, France, Hong Kong, Ireland, Netherlands, Poland, Spain, Italy, Germany, Austria, Bahamas, Israel, Mexico, New Zealand, Singapore, Switzerland, Norway, Saudi arabia, Ukraine, United arab emirates, Qatar, Kuwait, Bahrain, Croatia, Malaysia, Brazil, Chile, Colombia, Barbados, Bangladesh, Bermuda, Brunei darussalam, Bolivia, Ecuador, Egypt, French guiana, Guernsey, Gibraltar, Guadeloupe, Iceland, Jersey, Jordan, Cambodia, Cayman islands, Liechtenstein, Sri lanka, Luxembourg, Monaco, Macao, Martinique, Maldives, Nicaragua, Oman, Peru, Pakistan, Paraguay, Reunion, Viet nam, Uruguay.